Whether you have split ends, dry and weak strands, dandruff, or just a tangled mess, the likely culprit for almost all follicular problems is a lack of moisture. No one wants that dry, frizzy look--and with the slick, wet hair appearance coming back in vogue among high fashion and celebrity circles, the search is on to find natural, chemical-free ways to achieve beautiful hair with a healthy shine. One of the best remedies just so happens to be olive oil. In fact, humans have been using olive oil in beauty routines for literally thousands of years, and it's now making a comeback with many proponents saying that the traditional cooking ingredient is actually a miracle tonic to soften hair while also adding shine, body, and strength. It's also easy. Unlike some other oils commonly used to treat hair such as avocado oil, coconut oil, or mineral oil, olive oil is already in many kitchens and can be comparably cheaper. The general health benefits of olive oil are already well-touted by the health community. It has omega-3 fatty acids, specifically oleic acid and alpha-linoleic acid, that are great for heart health and weight management when consuming it on a regular basis. Using olive oil topically on skin has also been shown to have some rather remarkable effects, such as reducing oxidative damage and inflammation. Hair, too, reaps the rewards. Here are just a few ways strands ultimately benefit from olive oil treatments. Oils in general have one major demonstrable effect on hair--slowing the loss of moisture. Scientists have observed that hair treated with oil eventually slowed both processes of absorption and diffusion of water from hair fibers. Essentially, this means that, although oil-treated hair can't necessarily gain moisture, it's able to retain whatever moisture is already existing extraordinarily well. One of the rationales is the presence of vitamin E, which is found in abundance in olive oil. Vitamin E is an antioxidant and lipid protector with widely-touted abilities to keep skin moist and protect it from damage by free radicals. Those same properties work their magic when olive oil is applied to hair, also keeping strands moisturized and healthy. Although there is no definitive scientific link between olive oil and repairing split ends, researchers have found that oil plays an important role in protecting hair from physical damage. Normal, untreated hair tends to absorb and lose water with relative ease, leading to a constant cycle of swelling and drying of the hair fiber in a natural process known as hygral fatigue. Hygral fatigue is a primary cause of physical hair damage, including split ends. Oil helps reverse the effect in several ways. First, because oil prevents the absorption and diffusion of water in hair, less hygral fatigue occurs, which means less stress on strands that could make them more vulnerable. Second, the thick compounds in oils can actually fill the gaps between cuticle cells, so applying it to hair can actually prevent aggressive chemical substances from penetrating follicles and therefore improve overall hair health. Third, oils are able to cling to the surface of hair, basically forming a slick film on top of the hair shaft that reduces friction and increases shine. Coconut oil has even been shown to reduce protein loss in hair, which can make it stronger. Dandruff is what happens when your scalp becomes too dry and dead skin cells shed and flake off. If you suffer from dandruff, rather than using expensive chemical shampoos, try massaging some olive oil into your scalp. The natural moisturizing effects of the fatty acids and vitamin E in olive oil will help with the dryness and, over time, reduce or eliminate the frustrating condition. Dermatophytes are a group of three common types of fungus that can cause disease in skin, hair, and nails by obtaining nutrition from keratin, which is the primary structural protein in the body. More commonly, dermatophyte infections are referred to as Athlete's Foot, ringworm, or tinea. Most often, dermatophytes are generally treated with topical medications including fungicides and antibiotics, but scalp infections are a bit easier to tame and can actually be treated with just some olive oil. Scientists have found that unsaturated fatty acids, such as the ones found in olive oil, can completely suppress the growth of dermatophytes in the scalp. And perhaps more importantly, unsaturated fatty acids also prevent dermatophytes from penetrating hair and causing further problems. While there are several factors that contribute to hair loss, one of the primary culprits is a hormone called dihydrotestosterone, or DHT for short. DHT causes the hair follicle shafts to gradually narrow. In turn, this means hair will grow out thinner and thinner until, over time, it simply stops growing. There are many who believe that olive oil can help with hair loss prevention by decreasing the production of DHT hormones, but as of now there are no definitive medical studies proving that this is actually the case. A prominent theory, however, is that the azelaic acid found in olive oil is responsible for the decreased DHT production. Azelaic acid has been shown to inhibit the activity of 5-alpha-reductase, an enzyme whose main function is converting testosterone into DHT. By suppressing this cycle, it works to slow or even stop hair loss. As mentioned above, olive oil also has great anti-fungal properties, which may help protect hair loss that is caused by a fungal infection. There are several different methods of using olive oil for hair care. Whichever you choose to use, always be sure to opt for virgin or extra virgin olive oil, a high standard which means the liquid has been extracted naturally from olives without the use of heat or chemicals. Extra virgin olive oil is actually the purest form of olive oil available (though just make sure your is a certified product). Start with an olive oil treatment once a week. If your hair is particularly dry or damaged, you can also try two treatments per week and then work your way down to one. Also, before following any of these guidelines, make sure to wash your hair so that it is fully clean and any buildup or residue are washed away, providing a clean slate to work with. Option 1: Essential oil and olive oil mask. Heat up a small amount of olive oil until it is lukewarm. If you wish, you can add a few drops of tea tree oil, peppermint oil, or lavender oil to create a more aromatic smell. (Tea tree oil and peppermint oil are particularly beneficial because they have their own moisturizing and antimicrobial effects.) Once the oil is at the right temperature, apply to your scalp and hair a little at a time, gently massaging it in for several minutes. Wrap hair in a damp towel or shower cap and let sit for a few hours, or even overnight. When the treatment is complete, wash it out with shampoo and condition hair as normal. Option 2: Egg white and olive oil mask. Eggs are high in protein, and also have various vitamins and minerals that can have additional impact on hair. 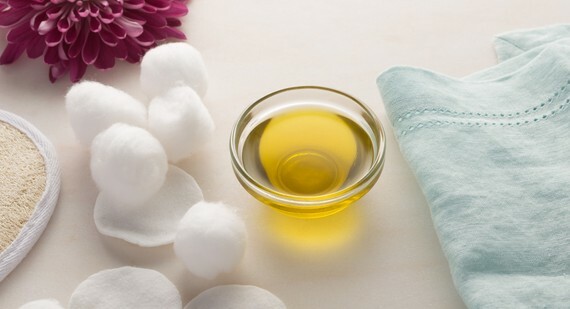 By creating a mask with egg whites and olive oil, it will help to really penetrate each follicle. Here's how to do it: Separate an egg white and beat thoroughly until it gets very foamy. Then, add in half a cup of olive oil and a teaspoon of honey, and mix well. Apply the mask to hair, working it in thoroughly. Leave in for 20-30 minutes before washing out with shampoo and conditioning as normal. Option 3: Avocado and olive oil mask. Avocados are also high in vitamin E and saturated fats, which doubles the effects of olive oil. To combine, mash half a ripe avocado with half a cup of olive oil until all the oil is emulsified. Apply the mixture to hair, working it in thoroughly, and then let it sit for 20-30 minutes before washing and conditioning. Option 4: Coconut oil and olive oil mask. Coconut oil is over 80 percent saturated fat, with a hearty dose of medium-chain triglycerides. By mixing coconut oil and olive oil in a 2:1 ratio, you can get the beneficial effects of both. Massage the mixture into your scalp and from root to tip, and leave in for 15 minutes before washing and conditioning.